Decorating for the holidays has been rooted in tradition for centuries. Even ancient cultures enjoyed honoring the season by bringing bits of their natural world inside. Festive activities are a fantastic way to build anticipation and excitement leading up to the big day. While it is tempting to run to the nearest dollar spot to stock up on polyester cobwebs, fake pumpkins, and plastic greenery or trees, many of those items are cheaply made and usually end up in the trash. Landfills and secondhand shops are constantly bombarded with truckloads of one-time-use decorations. Not unlike the fast fashion industry, it puts a strain on the planet by the trash produced and by the resources used to make these items. Not to mention, we must wonder about working conditions for those involved in the manufacturing. 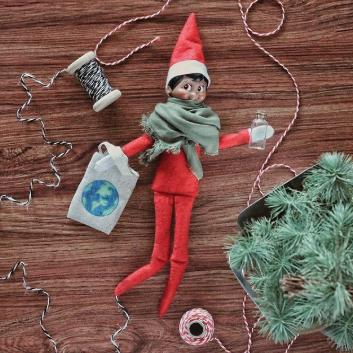 Since decorating for the holidays is one thing that I really love, here are a few ideas for Autumn and Winter decorations that won’t trash our planet. Invest in quality. If decorating is really something that you love, it’s worth investing in a few well-made decorative pieces that will last. Look for durable items like ceramic, wood, fabric, or metal. Along the lines of quality and longevity if you decide to use holiday lights, look for LED over the classic string of lights. Use naturals. Instead of buying décor made of synthetic materials, look around for natural items that can be used. Corn husks, wheat and real pumpkins and gourds are perfect for Fall decorations. The best part is that you can cook, can and freeze the pumpkins and gourds when the season has turned. Evergreens come in more than just pine; eucalyptus is a great option, but you may even find cedar or boxwood around your yard. It’s easy to throw a few pinecones into the mix too. Dried orange peels are always a favorite. I even loved using clear quartz crystals and copper wire to make tree ornaments. Speaking of trees, a secondhand artificial tree, a locally grown fresh cut tree, or a potted tree are more sustainable options to consider. Use compostable. Looking for something that will last, but not forever? You might be able to find paper mache or grapevine items that will last a few seasons and can be composted once you’re done. Try stringing popcorn for garland or making a paper chain and flag banner. Use fabric. Another way to dress up your home for the long-haul way is with fabric. You can add a table runner, pillow covers (I made one from an old sweater) or throw blankets. You can also make fabric leaves, or like I did this year, make a fabric pumpkin and stuff it with dryer lint. You can also repurposed yarn from an old sweater to make pompoms. Look for natural fabric whenever possible, or repurpose old fabric. Secondhand. Like I said before, secondhand shops get boatloads of decorations all the time. I still recommend buying for quality so that your items don’t end up in the trash. Don’t dismiss swapping with friends when they move or when they clean out their storage. Using secondhand items helps to extend the lifespan of an item and diverts it from the landfill. The more people who reuse the stuff that’s already been manufactured, the fewer natural resources are used to produce another brand-new item. Upcycle household items. My old ice skates, that one red and white scarf, an old broken clock, and that vintage telephone all mingle well with all my other holiday décor. Don’t be afraid to try something out of the ordinary, you might just love the way those house shaped cookie cutters look on your dining room shelf. Keep it simple. I find it easiest to keep the decorations on the minimal side and just mix a few items in with my regular home décor. It’s more simple and takes less to time to put up, take down, and store. Holidays are about enjoying the company of our family and friends. Customs change and evolve as each generation shapes the traditions that they feel most connected to. My hope is to teach my children to consider their impact on this planet by choosing traditions that honor nature’s beauty and the rhythm of the seasons. I think that it’s time for us a society to adopt a few new, and less wasteful customs; how about you? Lacey is a freelance writer and blogger living in Las Vegas. She has always had a love for healthy and sustainable living and has been practicing a zero-waste lifestyle since 2013. She juggles her time between writing about zero-waste mommin’, plastic free alternatives to parenting, and raising her little tribe of happy people to be mindful of what goes into their bodies and our planet. She’s into living simply, naturally, and purposefully all while trying to save the planet one sippy cup at a time.